(a) Place the safety switch in the F (FIRE) position. 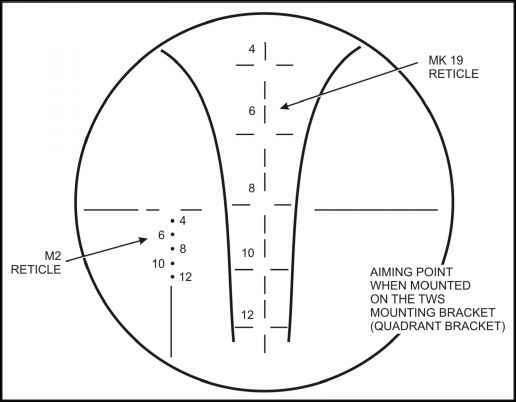 (b) Take out the backplate pin using the rim of a spent cartridge case or metal link. (c) Pry outward on the pin lip and remove the pin with the fingers (Figure 2-18). If the pin cannot be removed with the fingers, hit the small end of the pin with the secondary drive lever until the pin comes loose. (d) Grasp the control grips with both hands and lift up slightly to disengage the backplate from the locking lugs in the receiver. (e) Pull the bolt and backplate assembly to the rear. (f) Once the bolt clears the sear, catch the bolt in one hand to prevent damage to the backplate assembly (Figure 2-19). Figure 2-19. Removal of bolt and backplate assembly. (9) Take off the primary drive lever and vertical cam. 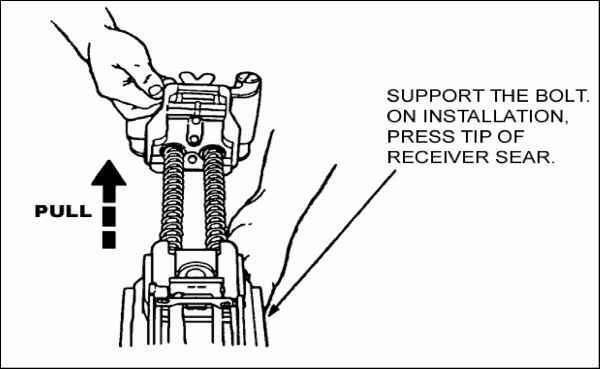 (a) Grasp the primary drive lever and vertical cam with one hand and ensure they do not fall when released. (b) Reach under the top of the receiver and locate the drive lever lock. (c) Slide the lock one-quarter of an inch to the rear. (d) Press down on the primary drive lever pivot post, which releases both the primary drive and vertical cam. (e) Pull the primary drive lever from the front of the weapon and the vertical cam from the back (Figure 2-20).